Have you ever heard of the Chinese expression "ga liew"? Literally, it means to add more ingredients. Typically, it can refer to bringing something extra to a meal such as takeout or in most cases - Chinese BBQ. I remember going to family meals where we would bring some BBQ duck. I loved the plum sauce. I would often use one packet for one piece of duck. Yah, I liked the sugar. I was a kid, who could blame me? I just didn't understand why they had to stuff it in with the duck. Made the packet so darn greasy! Fast forward to the present, I grab Chinese BBQ because I'm just plain lazy and don't really want to make a meat dish for dinner. Buy some cooked meat and just water-blanch a bunch of gai lan and voila - dinner! So, continuing on my adventures in Chinese BBQ, I paid a visit to Crystal Mall. Yes, my favourite place besides Richmond... 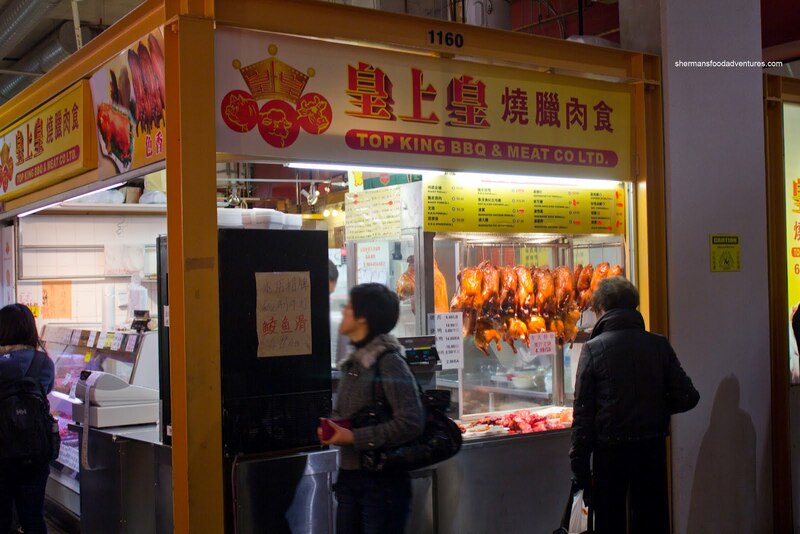 I dropped by Top King BBQ, which I've tried before, but never had the urge to blog about it. This time, I went for the big 3 which included Roasted Pork. The trick here is to have a crispy skin without being too hard. It was more or less like that. The meat on the other hand was a different story. 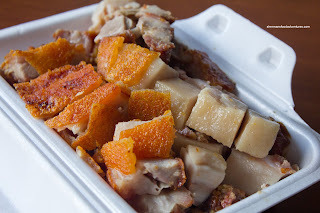 It wasn't as succulent as the one from HK BBQ Master (but really, what is?). It was a bit too salty in parts too. I decided to get a whole BBQ Duck because it is generally more moist since it wouldn't be hanging in the display drying out (like half of a duck). This would be true in theory if the duck itself was prepared properly in the first place. Unfortunately, we found the meat to be dense and dry (especially the breast meat). Furthermore, the flavour just wasn't there. 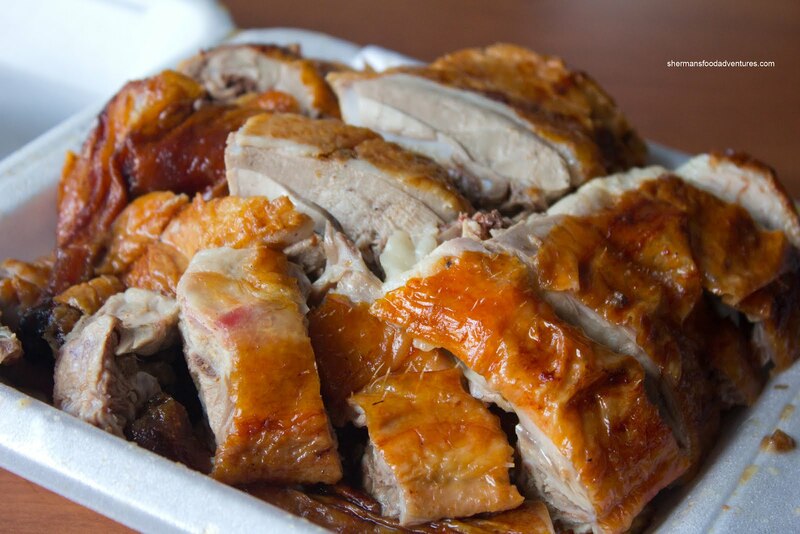 Now, we could gladly accept the roast pork and BBQ duck for what they were, but as for the BBQ Pork, this was a complete fail. 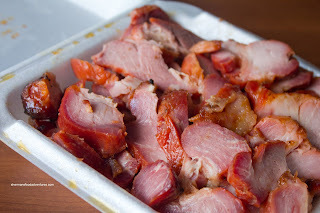 The meat was marinaded far too much and became more like a ham than BBQ pork. By just looking at the colour of the meat, the red colouring penetrated completely through the meat. Hence, the texture was off as well. Suffice to say, it was salty and lacking in meat flavour. This is the 2nd time we've bought stuff from here and it hasn't been that impressive. I'm quite surprised that it can compete with Delicious BBQ upstairs. I guess the lack of competition nearby helps its cause. @LR You must be clairvoyant! @tony Thanks for the kind comments!